This project was realized through a generous support from CO Architcts of Los Angeles. In-Sight: Video Demonstration of the working prototype. Movie info: QuickTime, 2min 25sec, 530x300 pixels, 6.4Mb, HD version available at YouTube. For the past few years, architects used 2D renderings of 3D models to convey their designs to each other and their clients. Although 2D images of 3D representations of designed buildings have always served architects to present their work to their clients, it’s always difficult for the client to imagine what the building will look like in the physical world. 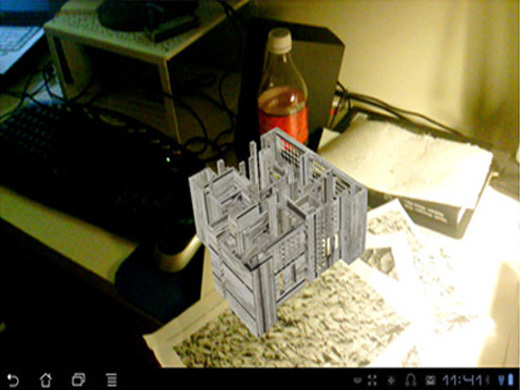 Augmented reality(AR) can help users to see the mixed world, with virtual objects superimposed upon or composited with the real objects. We want to offer users and designers a way of seeing the to-be-built building on site in 3D. 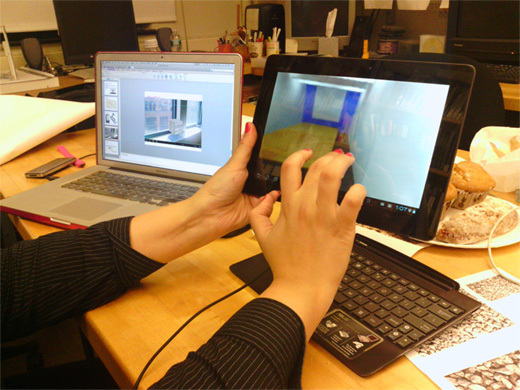 We create an augmented reality system in a hand held device such as a phone or a tablet. This system can be used in the pre-construction and a potential application of post-construction. It is a visualization tool that enables clients and designers to see what the building will look like on site before building it. This system will help in taking decisions and changes. 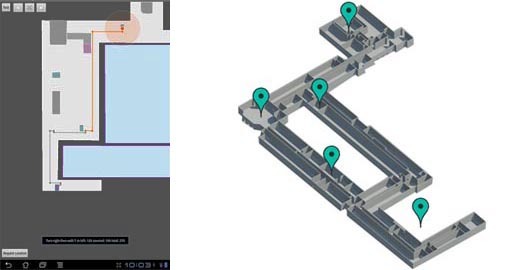 Any client or user would be able to go to the construction site with this device, and look through it to see the virtual 3d model imposed on the physical environment in front of him/her. This system could be used for (a) 3D viewing of the exterior building, its approach and entrance. (b) The interior design of the room and viewing the different lighting conditions during different times of the day. The user can also add notes on parts of the model while viewing the model in the physical context. Fig 1. 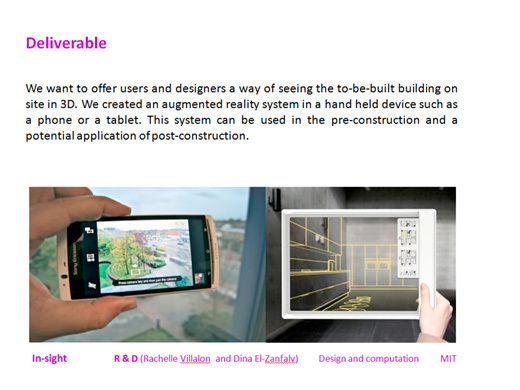 Deliverable: Augmented reality system in a hand held device. Fig 2. In exterior space, the application listens for location updates from a Network/GPS provider using Android 3.2.1 on an Asus SL101 Tablet. 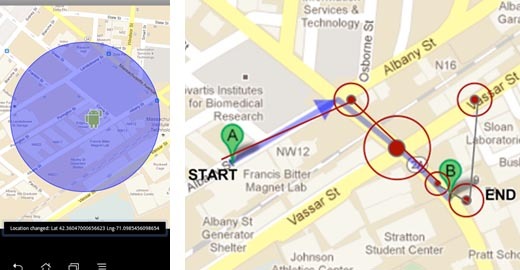 Information includes: atitude and Longitudeddress via reverse geocoding, converted street address (accuracy in meters), Identification of a Network or GPS provider during travel, and speed of travel. Fig. 3 Once the user gets into a building, WiFi reception signals are used to accuately locate the user position and bring up an appropriate image for the location. Fig 4. 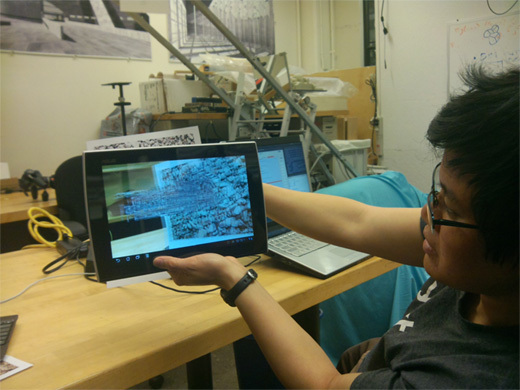 Prototype Experiment: Pattern recognition with 3D object projection on a tablet.. Fig 5. Final Project (prototype 1): 3D space navigation using the 3-axis accelerometers of a tablet. Fig 6. Final Project (prototype 2): Virtual reality 3D model on pattern recognition.